Growing up, my family celebrated both Christmas and Hanukkah, and I loved being half Catholic - half Jewish. But over the years, I became more "neither" than "both". As I grew older, I began to understand that Christmas and Hanukkah were about far more than presents. The stories of both religions held my family history, and I felt connected to both sides, revering the traditions of all my grandparents, aunts, uncles, and cousins. My pride shifted away from the quantity of presents, and towards the quality of my parents’ marriage as a testament of how the two religions could come together. But in junior high, personal commitments to one’s religion began. My Jewish peers were Bar Mitzvah-ed, my Christian peers were confirmed. Now it was no longer just about family tradition and history but also about belief and faith. Furthermore, my parents, who had been happy to indulge in the winter holiday celebrations, were not all that interested in joining either of the religious organizations that had, as I later discovered, refused to acknowledge their marriage years earlier. My pride wavered and, unable to choose one over the other, I lost my status of being "both." I became "neither." Still, we continued to celebrate Christmas and Hanukkah in our home, and I grew to love the celebrations for the light and warmth they brought to the dark months. This simple question triggered something: a longing, a sadness, something, though I’m not quite sure what. Perhaps I had a little too carelessly forgone an important component of my childhood. Judaism, just as much as Christianity, is a part of my past, my parents’ relationship, and the long history of both sides of my family. I suddenly wanted it back. But how do I bring back my family tradition when I no longer feel Jewish? Do I even have the right to observe the Jewish holidays at this point? Is it ok to hold onto the tradition when I was not raised with the religious belief? These are questions I ask myself, and I am not sure of the answers. But I am beginning to feel a desire, a responsibility, to share this history with my children. Perhaps I will start slowly. We will read books that tell the story of Hanukkah. I will share the traditions of my childhood. 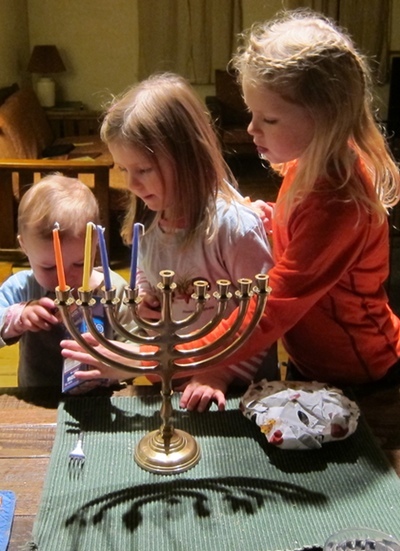 We will light the candles of our family menorah and say the blessing. And my children will receive dental floss, pencils and Scotch tape as gifts, just as my sister and I did when we were little.